On March 30, 1867, the United States agreed to purchase Alaska from Russia for $7.2 million dollars, about two cents an acre; "Seward's Folly" many called it, after Secretary of State William H. Seward. A check for $7,200,000.00 was issued on August 1, 1868 and made payable to Edouard de Stoeckl, the Russian Minister to the United States. On January 3, 1959, Alaska, with a land mass larger than Texas, California and Montana combined, became the 49th state in the union. It is a large state, 1/5 the size of all the other states together, reaching so far to the west that the International Date Line had to be bent to keep the state all in the same day. It's also the only U.S. state extending into the Eastern Hemisphere. In Alaska, the "family car" has wings, vegetables and fruit grow to two times their normal size and moose interrupt golf games when they feel like it. 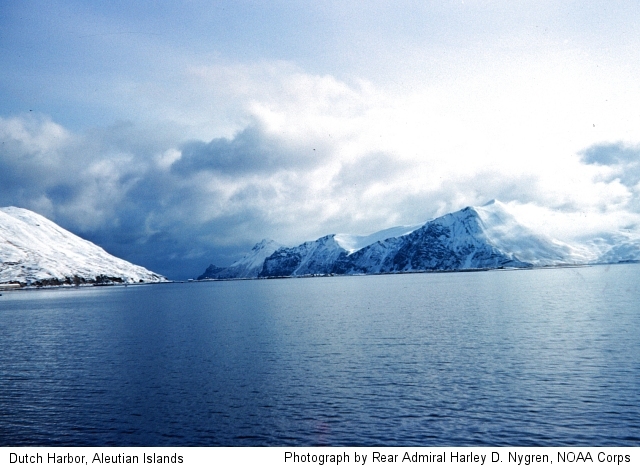 The name "Alaska" was used by the Russians to refer only to the peninsula. This name was used by the United States to refer, first to the entire territory, and then, to the State after its purchase in 1867. The name "Alaska" is taken from the Aleut word "aláxsxaq" that refers to an object to which the sea is directed, in this case the Alaska peninsula and mainland. This is sometimes loosely translated as "great land." Alaska, admitted as the 49th state to the union is thought of as "America's Last Frontier" because of its distance from the lower 48 states and because of its rugged landscape and climate. This remote and rugged perception is evidenced by the fact that only about 1/3 of the state has been organized into political units; 13 boroughs (similar to counties) are defined. This nickname refers to Alaska's northern locations where, for a period of time, in the summer, the sun never completely dips below the horizon. The sun is visible at midnight. Parts of Alaska are bathed in 24 hours of daylight. In Barrow, the sun doesn't set for 84 days. For more information about the extremes of Alaska days and nights, visit the Alaska.Gov kid's corner. When the agreement to purchase the Alaska territory from Russia was struck in 1867 by Secretary of State William H. Seward, there were many in the lower 48 states, who looked upon the deal with skepticism and were critical of the secrecy that had surrounded it and of the high price tag. Though Seward finalized agreement with Russia in March, it was a long and bitter battle to get final Congressional approval for the purchase and then get Congress to approve the money for the purchase. During this period, critics of Seward's agreement to purchase the Alaska territory from Russia called the plan referred to the plan as "Seward's Folly." Congress, finally relented and on October 18, 1867, in Sitka, the Imperial Russian Flag was lowered and the Stars and Stripes was raised. The is another derisive name given to the Alaska territory during the battle between Secretary of State William H. Seward and the United States Congress over the purchase of the land from Russia. Other satirical names were "Icebergia," "Polaria," and "Walrussia." Critics of the purchase also chastised the President of the United State, Andrew Johnson, by referring to the Alaska territory as "Johnson's Polar Bear Garden." People who live in Alaska or who come from Alaska are called Alaskans. The fourth quarter released by the United States Mint in 2008 commemorates the State of Alaska. It is the 49th coin to be issued in the Mint's 50 State Quarters® Program. On January 3, 1959, Alaska became the 49th state to be admitted into the Union. The reverse of the Alaska quarter features a grizzly bear emerging from the waters clutching a salmon in its jaw. The coin's design includes the North Star displayed above the inscription "The Great Land" and the inscriptions "Alaska" and "1959." The 11-member Alaska Commemorative Coin Commission, appointed by former Governor Frank Murkowski, invited Alaskans to submit design ideas for the Alaska quarter. From the 850-plus submissions, four concepts were forwarded to the United States Mint for consideration. These concepts were developed into design candidates by the United States Mint's Sculptor-Engravers and artists in its Artistic Infusion Program. On April 26, 2007, Governor Sarah Palin announced her selection of the grizzly bear and salmon design following a statewide comment period. Alaska (From Sea to Shining Sea) , by Barbara A. Somervill. 80 pages. Publisher: Scholastic Library Publishing (March 2002) Reading level: Grades 3-5. Presents information about Alaska's people, geography, history, landmarks, natural resources, government, state capitol, towns and cities, and more. Alaska (World Almanac Library of the States) , by Isaac Seder. 48 pages. Publisher: Gareth Stevens Publishing (February 2003) Reading level: Ages 9-12. Filled with the most up-to-date information, including the latest Census results. Full-color photos bring to life the story of Alaska. In addition to an in-depth factual profile of Alaska in the form of a state Almanac, this book offers fascinating and lively discussions of the state's history, people, geography, government, economy, culture, and lifestyles. A section on Notable People, a calendar of events, and enough primary source documents, time lines, maps, and other tools to make this unquestionably the best young adult reference material on the USA available anywhere. The Alaska Almanac: Facts about Alaska , edited by Nancy Gates. 256 pages. Alaska Northwest Books; 32nd edition (November 1, 2008) Completely updated and redesigned edition of the perennial bestseller. The Alaska Almanac is an indispensable reference for those who are traveling to the north or those who already know and love it but want to impress others with their encyclopedic knowledge of Alaska's fascinating past and present. 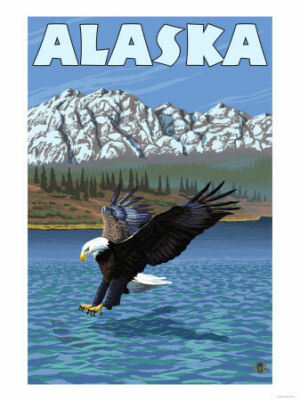 2009 marks the 50th anniversary of Alaskan statehood along with the 50th anniversary of Alaska Northwest Books. This edition features factoids and nuggets about statehood as well as facts and figures on geography, history, economics, sports, cultures and people of the Last Frontier. Humorous blurbs and pointed commentary from Mr. Whitekey's geared to statehood will be included. There is no better reference than the Alaska Almanac for those who want to really "know" Alaska. Alaska: A History The largest by far of the fifty states, Alaska is also the state of greatest mystery and diversity. And, as Claus-M. Naske and Herman E. Slotnick show in this comprehensive survey, the history of Alaska's peoples and the development of its economy have matched the diversity of its land- and seascapes. Alaska: A History begins by examining the region's geography and the Native peoples who inhabited it for thousands of years before the first Europeans arrived. The Russians claimed northern North America by right of discovery in 1741. During their occupation of "Russian America" the region was little more than an outpost for fur hunters and traders. When the czar sold the territory to the United States in 1867, nobody knew what to do with "Seward's Folly." Mainland America paid little attention to the new acquisition until a rush of gold seekers flooded into the Yukon Territory. In 1906 Congress granted Alaska Territory a voteless delegate and in 1912 gave it a territorial legislature. Not until 1959, however, was Alaska's long-sought goal of statehood realized. During World War II, Alaska's place along the great circle route from the United States to Asia firmly established its military importance, which was underscored during the Cold War. The developing military garrison brought federal money and many new residents. Then the discovery of huge oil and natural-gas deposits gave a measure of economic security to the state. Alaska: A History provides a full chronological survey of the region's and state's history, including the precedent-setting Alaska Native Claims Settlement Act of 1971, which compensated Native Americans for their losses; the effect of the oil industry and the trans-Alaska pipeline on the economy; the Exxon Valdez oil spill; and Alaska politics through the early 2000s.